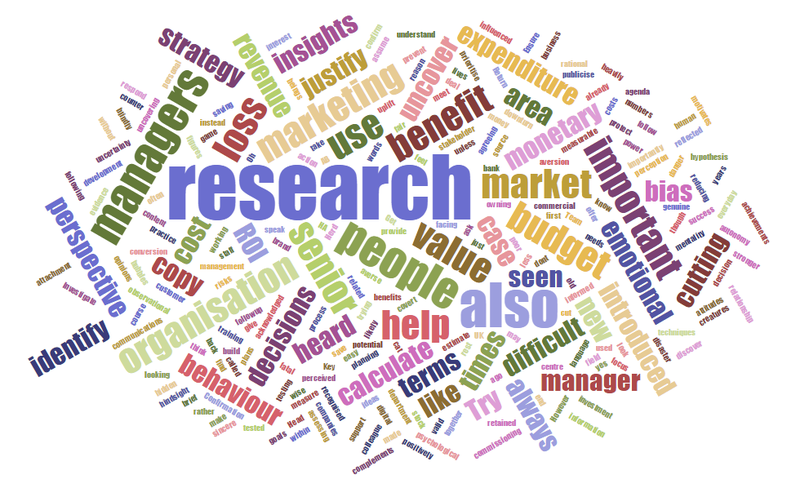 Do Companies Care About The Quality Of Market Research? What Do Executives Care About? I’ve read a number of posts about the quality of market research. Some of these posts have criticised poor practices of research suppliers and others point to the frailties of client side-researchers. Some valid points have been made, but there is a danger that we are missing the bigger picture here. Market research is a collaborative process and unless all parties work together we will gather data, but we are unlikely to gain much insight. This of course includes the people we call respondents. As Mark Earls points out in his book Herd, co-creativity is deep rooted in human nature. Most new ways of looking at problems are the result of people working together in groups rather than on their own. This is why the nature of the relationship between the client, agency and respondent is so important to the success of research. Most senior managers in client-side companies are more concerned about the quality of insights and the action that results from research spend. They tend to assume that we are the experts and will use our professional judgement to ensure research is carried out to the required standard. There are many challenges on both the client-side and the supplier-side to completing a successful research project. However, from working on the client-side there are some practices that can help the different parties work together more collaboratively. Keep processes manageable and simple. I once came across a colleague who was updating a manual for a continuous customer satisfaction project that was over 100 pages long. The research agency was expected to follow the procedures in the document! Even if someone did read the manual there is no way that they could digest every procedure and ensure they were all implemented. “Of course, organograms, Gantt charts and 6-sigma processes all make us feel more secure. But this security is based on just the same illusory roots as our own individual volition and sense of self.” Mark Earls, Herd. Include action planning or post-research workshops in the brief and proposal to ensure that it is positioned to all concerned as an integral part of the process. This can help kick start the process of getting buy-in and commitment from client-side management to an essential part of any project. Unless planned from the beginning there is a risk that management will create a separate process and the research team may not even be involved. Focus on using your interactions with each other to exchange ideas and knowledge. This can be particularly useful when conducting a review of published research and current thinking related to the business problem. There are also a number of ways that client-side researchers can encourage a more collaborative approach and improve the chances of valuable insights being identified from a study. Don’t rely solely on head office management’s view of the business problem. In any large organisation it is difficult for Head Office management to be in touch with what’s happening at the coal face. Company culture and human nature often don’t encourage staff to feedback problems they encounter. Research agencies may be able to help with this process, but it’s valuable for the client-side research to meet with staff at different levels that are directly affected by the problem. This can be a great source for developing hypothesis to test in your research. Try to uncover hidden agendas’ by engaging with different stakeholders. Challenge the need for research. What would happen if no research was undertaken? Explore what stakeholders anticipate will come out from the research and what they perceive to be the main barriers to change. Don’t be too prescriptive with your research brief. You can state your preferences for how the research should be designed, but leave it open for discussion and refinement. Don’t look at the project in isolation. Share other relevant insights with your research agency and discuss whether they can add value to your current project. There are also behaviours that research agencies can employ to improve the relationship with the client and thus encourage a more collaborative approach. These may seem obvious, but I’m amazed how often agencies don’t follow these practices. Research the organisation and client. A lot of client-side teams have been downsized over recent years and so have less time to brief suppliers. Help the client by doing some homework. Use LinkedIn to find out about the background of the client. When you get a brief from a client call them up to discuss the brief. Find out about the background to the project and allow the client to explain their thinking behind the suggested approach. See how open they are to alternative and more collaborative approaches. Don’t just re-produce the brief in your proposal. Take the opportunity to add value to the brief and if appropriate look at the problem from different angles. Clients are often put off a proposal if it is perceived to follow a standard template and there is little effort to explore the business problem further. Be up front about the level of time and support you can offer before you need to charge additional fees. Many client-side researchers are under pressure to save money and don’t appreciate having to request an increase in budget. Find out about your audience and who the key stakeholders are. Ask the client-side researcher to brief you about any reservations or concerns stakeholders have about the research. Focus on insights rather than data and methodology. It is a myth that turning up for a debrief with a large PowerPoint deck or a set of data tables impresses clients. Management would rather focus on one slide with genuine insights than spend an hour going through a long detailed presentation. Market research is not about quality, the client or the agency. What matters is the customer or prospect and what insights we can derive from the whole process. To maximise insights we should seek to collaborate with all parties involved to avoid over-focusing on our internal procedures and policies. How Do Social Networks Influence Consumer Behaviour?